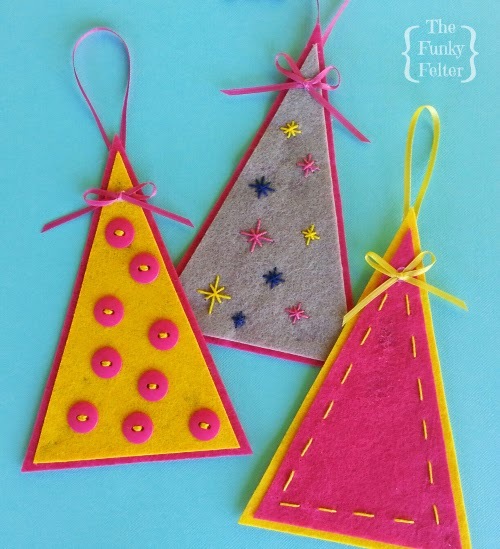 Make Your Own Felt Ornaments Set! This stiffened felt craft was born out of a yearning to decorate for Christmas. Yes, I am one of those who likes to listen to Christmas music on the radio when stations start it in early November. I rock out to all the classics while I craft. Go ahead, give me a good eye roll. My husband does all the time about the issue and, I must say, that I'm a little disappointed in myself that I can't contain it until after Thanksgiving. *sigh* Yes, yes, I am one of those crazies that starts planning the Christmas decorations to pop up right after the Thanksgiving turkey cutouts and Fall owls get put into a bin the week after Thanksgiving. This charming felt project is super quick and easy. The felt ornament is also great for kids to make and personalize with buttons, stitches, stickers and other embellishments. You can dress these up or keep them simple with bold colors to adorn your Christmas tree. After all, it is merely weeks away now. Eeeep! Where has the time gone? So I'm planning and plotting and already making felt Christmas decorations and a variety of handmade gifts for the holidays. Since it feels like I'm constantly short on time during my weekdays ("what, no, it is already time for school to be out, but I'm still crafting" sound familiar? ), I like quick and easy projects spread throughout my week so I can have the satisfaction of finishing a craft or sometimes a couple during a week's time. Don't get me wrong, I like more involved projects too, but the instant gratification of making something pretty is always a nice boost to my happy odometer. Can you relate? Hence, this felt tree ornament! Choice of embellishments like buttons, embroidery thread, stickers, rhinestones, etc. These stiffened felt trees are very easy to make. You can create a dozen or more in one sitting and then personalize them any way you like. Or, have your kids, a scout group, youth group or other kids organization make them for holiday gifts or to handout at a local senior center! They are wonderful ornaments for kids to make. 1. Download and save the free printable felt pattern. Print two, cutting out each size rectangle to use as pattern templates for tracing. 2. Trace the triangles separately onto coordinating colors of stiffened craft felt. Cut out each. 3. Layer the smaller triangle on top of the larger one centered. Use either hot glue or tacky glue on the back to secure it in place. I recommend a thick white tacky glue if making these with kids. Be sure to let it dry several hours or over night though before embellishing. For more tips on gluing all sorts of felt, visit my best felt glues article. 4. Use a narrow satin ribbon, string or yarn for a hanger. Cut a 6-8 inch length and knot one end. Glue to the back top of the felt tree ornament. Make a cute bow if you like and glue to the front as seen in the photo. 5. Now embellish until your heart's content! I like hand stitching so I sewed buttons on one, made some freehand long-armed Smyrna cross stitches on another and went around the edge with a running stitch on the last one. These bright felt tree ornaments are equally as cute with no embellishments at all. You could also personalize them with a name or year, or even a family photo with a cute felt frame around it (I may have to try that idea soon!). Are you working on any felt ornaments or otherwise quick and easy Christmas decorations and gifts yet? Too early to think about? Or maybe you are one of those people like me who is already a bit Christmas obsessed! I have several more felt & fiber Christmas craft tutorials coming up. Don't miss out! Please be sure to enter your email address in my subscription box on the right side bar to get my posts feed in your inbox and also subscribe to my monthly newsletter here. Happy crafting!